Offer small songbirds a charming summer home with the Home Bazaar Post Lane Cottage Bird House. This impressive structure evokes the grand homes seen on the east end of Long Island, New York, with its wraparound balcony and turret. The roof has individual western red cedar shingles, offering a realistic effect. Three flower baskets with red fabric blooms hang from the porch, and delicate porch railings complete the look. The two 1.125" diameter entrance holes lead into the home, which is separated into two apartments with an interior wall. Screening under each entry helps nestlings climb out, when it is time to learn to fly. The deep design of the home creates a roomy nest, and the tall roof helps it stay cool. A ventilation gap and the shelter's white color further help the birds maintain a comfortable roost. The back of the home has a removable panel for cleaning and nest checks, while several drainage holes on the base allow the nests to stay dry. The natural color of the shingles contrasts the timeless elegance of the white wood, for a classically styled home. Use a mounting bracket (not included) to place this home on a post or pole (not included), adding height to the unit. 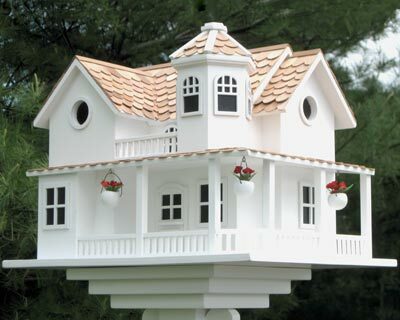 Create a chic look in your bird garden with this Post Lane Cottage Bird House.